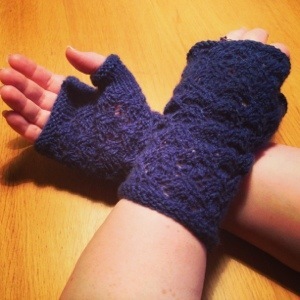 A co-worker of mine made me a pair of wrist warmers some years ago. I’ve figured out I need more than one pair though as I never seem to have my wrist warmers with me when I really need them. My mother-in-law enjoys knitting and crocheting so a few weeks ago on a day my wrists were hurting really bad (se my earlier post: No pain no gain) and I if course had forgotten to bring them with me to work I asked if she could make some more to me. Now just 3 weeks later she’s made me 6 pairs! All in different styles and colors. A few more “nicer looking” so I can wear them on special occasions. Two of them even covers the joints in my thumbs! Perfect presents and I know I’ll get good use of all of them! 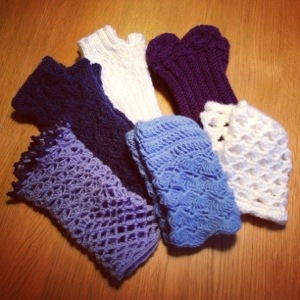 Thank you for spoiling me with so many beautiful warmers. My wrists are forever grateful! Your mum in law is a very talented knitter, looking at the different stitchings she has used!